In the first century AD, newly minted Christians, constructing a vocabulary for their fledgling religion, chose the term passio for the agony that Jesus endured to redeem a world of sinners. Etymologists trace its roots to the Latin passus, past participle of pati (to suffer), inspired by the sacrifice of Christ and that of the first martyrs. Healers appropriated the word for maladies such as “passion of the liver”—a diagnosis that conjures an organ engorged with rage. 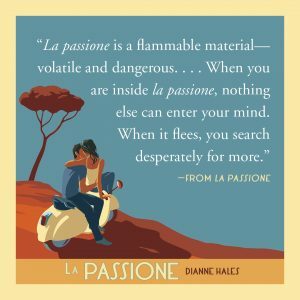 The Dizionario Affettivo della Lingua Italians (Emotional Dictionary of the Italian Language) describes la passione as a flammable material—volatile and dangerous. When it possesses you, it causes infinitesimal, voracious particles to pulsate in the blood. You risk burning like a torch, flaming bright, and then disintegrating into embers. When you are inside la passione, nothing else can enter your mind. When it flees, you search desperately for more. Passion—and passion alone—lifts us above the ordinary. Without passion, there would be no literature, no art, no music, no romance, perhaps none of the wonders Italians have wrought. Beyond sentiment or emotion, la passione qualifies as a primal force of nature that cannot be ignored or denied. 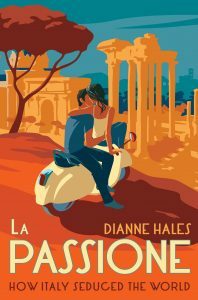 You will find more–much more–about this fierce drive to explore, discover, create, pursue beauty, and love and live with every fiber of one’s being in my new book, La Passione: How Italy Seduced the World. You can preorder it here or find it wherever books are sold on April 16.